The deadlines differ from state to state, as do the sources required to report, the pollutants reported, and the methods of submitting your information. 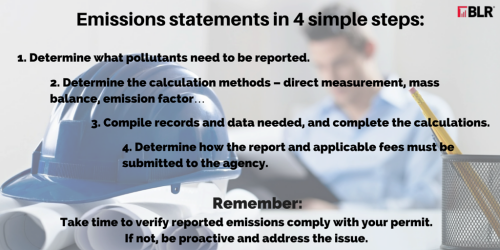 While your air permit most likely states the due date of your emissions statement, what needs to be reported and whether the report can or must be submitted electronically may require a little research. Actual vs. potential emissions. Typically, when quantifying emissions for an annual emissions statement, you are only concerned with actual emissions as opposed to potential emissions, which are more crucial when applying for an air permit. 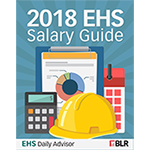 Actual emissions are based on what really happened at your facility during the reporting year, whereas potential emissions are typically determined based on the facility operating at maximum capacity for 8,760 hours a year. Pollutants. Each regulatory agency may require reporting of a unique set of pollutants, and the pollutants reported may depend on parameters such as the major source status of the facility (i.e., potential emissions), the attainment status of the area where the facility is located, or some other unique agency regulation. Other pollutants specified by state or local regulatory agencies. What are the best ways to calculate emissions? Direct measurement. Direct measurement is the use of a continuous emissions monitoring system to monitor and record emissions of selected pollutants. Direct measurement is the most accurate method of quantifying emissions. Stack tests. The results of previously conducted stack tests can be utilized to estimate emissions. In order for the stack test results to be useful, the parameters under which stack tests were performed must be an accurate representation of the source’s actual operations. Mass balance. In its most simplistic form, a mass balance is used to calculate emissions by equating the input of a process to the output of the process with the difference assumed to be lost as air emissions. However, mass balances can become significantly more complicated when taking into account chemical reactions, accumulation, depletion, etc. Modeling. In some cases, computer models have been developed to calculate emissions based on specific input data. Emissions factors. Emissions factors are the most common and inexpensive method of calculating emissions and are derived from actual emissions measurements from various processes. Emissions factors are applied to processes similar to the one used to derive the factor in order to estimate emissions. Emissions factors are available from many sources, such as the EPA, professional societies, equipment manufacturers, etc. The most commonly referenced sources of emissions factors are EPA’s WebFire database and Compilation of Air Pollutant Emission Factors, Volume I: Stationary Point and Area Sources, otherwise known as AP-42. The reliability of emissions factors can be called into question if there are differences between your source and those used to determine the factor or if the factor is based on a limited number of sources. So, take care to evaluate the limitations associated with chosen emissions factors. Engineering judgment. In the absence of any other acceptable methodology to calculate emissions, engineering judgment may sometimes be acceptable provided enough supporting documentation is provided to allow the regulating agency to logically understand how the estimation was made. Emissions statement submissions are often used as the basis for emissions fees. Again, this varies from state to state, so be aware that payment of a fee may be required, and know when that payment is due. Also, annual emissions inventories are an easy way to assess compliance. So, check to make sure the emissions you are reporting are in compliance with your permit. If not, be proactive, and address the problem.